Things at the Sanctuary have gone sour, and the Brotherhood can't afford chance or weakness. Read Lucien's letter to you. Meet him in Fort Farragut. Eliminate everyone in the Sanctuary. Return to Lucien for your reward and your new way to receive contracts. The "Of Secret And Shadow" mini-quest directs you to talk to Ocheeva. She tells you that you have received a letter from Lucien. Apparently the Black Hand itself has a task for you. For more details, you need to travel to Lucien's current residence in Fort Farragut, just northeast of Cheydinhal. The letter also warns you that you must not speak to anyone in the Sanctuary about the letter and you should be careful about the residents of the fort. The tower is full of undead and traps and may prove somewhat difficult if you aren't prepared. However, you can bypass everything and enter through the secret door. This door is located just outside Fort Farragut, inside a hollowed out tree immediately northwest of the fort's tower. When you find Lucien, he tells you about the assassin among the assassins that you may have already heard about. He tells you that you are not a suspect because you are a new member, but the assassin is definitely in the Cheydinhal Sanctuary. Lucien informs you that you must perform a Purification upon the Sanctuary. 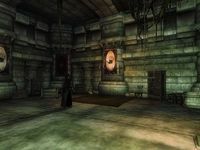 This means that you must kill every member of the Dark Brotherhood in Cheydinhal that Lucien names (Schemer and the Dark Guardian are above suspicion for their own reasons). As you have become a Silencer, you are permanently exempt from following the Five Tenets. You should have no problem killing the Sanctuary members. Lucien gives you some items which may help you in your mission, and you don't have to fight all the members at the same time. If you are seen killing any of the sanctuary residents, the people who see you (including the Dark Guardian) will lose 70 disposition points. This may be enough to cause them to attack you. The only people who may give you trouble are Gogron gro-Bolmog, Teinaava, and Vicente. Teinaava and Vicente have good swords and Gogron wears heavy armor and carries an enchanted battle axe. Getting rid of Telaendril may be tricky, as she is absent from the city on Loredas and Sundas. One way to determine her whereabouts is looting Ocheeva's corpse and acquiring Telaendril's note. You can also follow her quest marker on your map. If you don't want to follow her around, you can wait until Middas, when she returns to the Cheydinhal Sanctuary. Alternatively, you can find her near the Mages Guild on Turdas. You can choose an appropriate dialogue option to infuriate her and prompt her to attack you. If you run to any nearby guards, they will take care of her for you, saving you the trouble of fighting and an unnecessary bounty.It is also possible for Telaendril to get killed by bandits while travelling. You can also reverse-pickpocket a poisoned apple into her inventory, which allows you to kill her in public without incurring a bounty (assuming you were not seen pickpocketing her). Once you have killed everyone, return to Lucien. He tells you that you will no longer be receiving your contracts face-to-face but instead from letters in "dead drops". Each dead drop location will be revealed to you once you have completed your previous contract. The dead drop will hold your reward and the next contract. Lucien tells you the location of your first dead drop and gives you his horse, Shadowmere. Shadowmere is a very fast and strong horse, and is the only "quest essential" horse, meaning that she cannot die. She is extremely helpful for getting to the various dead drops and locations of the upcoming contracts. There are many ways to deal with Vicente Valtieri: in a note found in his desk he reveals he is vulnerable to garlic; reverse-pickpocketing a sample onto him will render him weaker than usual. Garlic can be easily found in Antoinetta Marie's Chest in the Living Quarters. Also, since he's a vampire, you might want to use Fire Damage against him. You can also kill him easily by talking to him while he is sleeping; after conversation he will immediately go back to his rest. If you start hacking away at him while he is in the middle of laying down, he will be defenseless for a few seconds until the animation completes. Frenzy can come in handy. Get 100% Reflect Spell, and stand in front of M'raaj-Dar when he is training. He will eventually kill himself. If a target is lured outside, the city guards will defend you. It is easier to kill the members of the Brotherhood with ranged attacks; the majority of them use short range weapons like daggers, with the exception of M'raaj-Dar and Valtieri. If you were planning to get the "Dark Gift" from Vicente's non-contract quest Darkness Eternal or to do Teinaava's Renegade Shadowscale quest, this is your last chance to do so. Opening the gate to Lucien's room causes all the Guardians to die. You can either enter through the trapdoor or sprint through the fort to the gate to avoid fighting. Don't forget to loot the chests in the Living Quarters. You can find keys to the chests on the bodies of your victims. The unique items sold by M'raaj-Dar are not available after you kill him (they are in an inaccessible merchant chest, and cannot be looted off his corpse). After finishing the last Dark Brotherhood quest, Honor Thy Mother, one of the Dark Brotherhood Murderers will provide access to M'raaj-Dar's spells, but not to the equipment. It is therefore advisable to purchase them from him before killing him. The barrel in Lucien's room - which has a Very Hard lock - contains ten respawning poisoned apples; their page has details on how to use them for assassinations. Even if you do not intend to use them, they sell for a decent amount of gold. An achievement will be unlocked upon reporting back to Lucien. The orders from Lucien address you with the rank of Eliminator, despite you being at Assassin rank at the beginning of the quest. After you complete this quest, you can no longer be exiled from the Dark Brotherhood. It is possible you may not receive Shadowmere upon completing the quest. If Shadowmere does not appear after quest completion, reloading a save may resolve the issue. Also ensure that when exiting the hideout you use the main door instead of the trap door. It is possible you will not receive a quest update after reading Ocheeva's orders, rendering you unable to advance in the quest. Simply reloading your previous save can fix this issue. 10 I must accept a contract from Ocheeva. 20 I have spoken with Ocheeva, and she has given me sealed orders from Lucien Lachance himself. Apparently it is an urgent matter, and I must read the orders as soon as possible. 30 I have read the sealed orders from Lucien Lachance. I am to meet him at Fort Farragut, which is in the wilderness northeast of the Dark Brotherhood Sanctuary. Apparently, he has a special assignment for me. 100 Finishes quest I have reported to Lucien Lachance at Fort Farragut, and received my special assignment. 10 I must kill every Dark Brotherhood member in the Cheydinhal Sanctuary -- Ocheeva, Vicente Valtieri, Antoinetta Marie, Gogron gro-Bolmog, Telaendril, M'raaj-Dar and Teinaava. Because I am now working for the Black Hand, I am no longer bound by the Five Tenets, and should employ any means necessary to Purify the Sanctuary. 20 The Purification is now complete. Every Dark Brotherhood member based out of the Cheydinhal Sanctuary has been killed. I must now report back to Lucien Lachance at Fort Farragut. 100 Finishes quest I have reported back to Lucien Lachance at Fort Farragut. He has advanced me to rank of Silencer and given me his own horse, a magical steed named Shadowmere. It is possible to use the console to advance through the quest by entering setstage Dark10Sanctuary stage, where stage is the number of the stage you wish to complete. It is not possible to un-complete (i.e. go back) quest stages. See SetStage for more information. Esta página foi modificada pela última vez à(s) 04h51min de 7 de novembro de 2015.